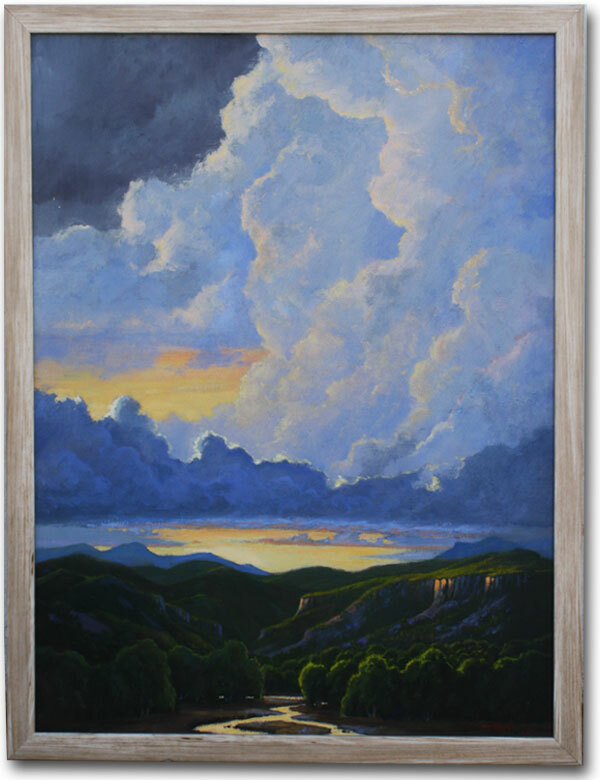 GMCR / KURU is proud to announce that esteemed Silver City artist, teacher and mentor, Tom Holt, has kindly and generously donated one of his exceptional landscape paintings to Gila / Mimbres Community Radio and one of you may become the proud owner! Voila! With the wild and natural places on our world disappearing in the wake of bad real estate management, I see my work as that of a “visual historian” as well as a painter. As a western born painter past the age of 50, I remember when most of it was wild. I’ve spent my life exploring, appreciating, painting, and being grateful for the opportunity to do so. I hope my gratitude and love for our land is apparent in my work. My painting includes the landscapes of California, Oregon, Washington, Idaho, Montana, Wyoming, Colorado, New Mexico, Nevada, Arizona, Connecticut, Nova Scotia, Pennsylvania, Massachusetts, British Columbia, and other areas of Canada. GMCR will be raffling this beautiful work and invite you to visit the station to see it in all its glory. The raffle tickets will be $100 each and only 100 tickets will be sold. A Voice & A Choice for Southwest New Mexico. No date has been set for the drawing as the raffle will remain active until all 100 tickets are sold however we expect (and hope!) that we will meet our goal of 100 tickets before the end of the year… just in time for the holidays! We will also be displaying the painting in a number of galleries around town and as these are scheduled, we will post those galleries, locations and dates here on this page. We can state with certainty that Leyba & Ingalls Arts will be one of the galleries that will display the painting and we thank them for their support of this effort by framing Tom’s beautiful painting for us. Again, our thanks to Tom Holt for his generosity, creativity and sensitivity to the precious treasures that we enjoy here along the Gila River. We have provided a PayPal option just below to get your raffle ticket online (how convenient!) or we would be happy to receive your check payable to GMCR in the mail, drop it through the mailslot in our front door, or if you wish to purchase with cash, please deliver that directly to a GMCR staff person.